The best cheap business class flights to San Diego we found for a client this month cost £1,745 for a return ticket. Find the best deal on flights today by completing the form on the left of this page. We’ll get back to you faster than you can say Gaslamp Quarter! Airlines with direct business class flights to San Diego from London: British Airways, Finnair (operated by British Airways), Iberia Airlines (operated by British Airways), and American Airlines (operated by British Airways). All direct business class flights to San Diego leave at 15:30 from Heathrow and land in San Diego at 18:45 in the evening. All flights are operated by British Airways on a Boeing 747 and come with the sophisticated level of service that makes British Airways a constant business class favourite. Passengers flying in Business Class with British Airways enjoy perks such as dedicated check-in, lounge access and a complimentary treatment in the Elemis Travel Spa before the flight. At San Diego International airport you’ll have access to the American Airlines Admirals Club Lounge. You’ll land at San Diego International Airport, no flights from London arrive at the Carlsbad Airport. 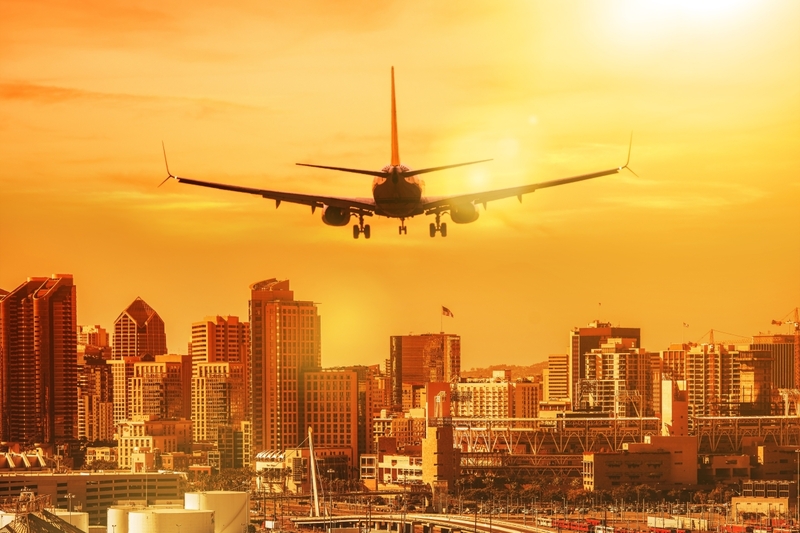 If you want to get to your accommodation as quickly and pain-free as possible after your business class flights to San Diego, use a private shuttle service. Skip the confusion of navigating terminals and book your ride in advance. 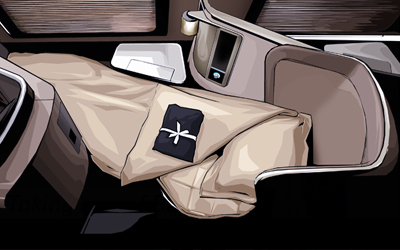 If you’d like to take a private taxi, rates are reasonable and vary from company to company. Check this chart to see how much it will cost to get to your destination and compare prices and car size. Using Amtrak Intercity and COASTER commuter trains is a convenient way to get into the city centre from the airport and provides reliable inner-city transportation. Compliment your business class flights to San Diego with a stay at one of the city’s top hotels. The Fairmont Grand Del Mar is said to be the best hotel in the whole of San Diego, and it’s not hard to see why. Spacious rooms, a 5-star spa, an award-winning French and Mediterranean restaurant, and a Tom Fazio golf course will make your stay unforgettable. The Lodge at Torrey Pines is a delightful resort full of California charm. With kilt-wearing doorkeepers, no detail goes unnoticed by the attentive staff. Enjoy the outdoors with access to the state park and southern La Jolla beaches. Cali Burrito – There’s nothing quite like a chip-stuffed Californian Burrito. Make sure you try out this carby indulgence. Gaslamp Parties – Live it up Vegas-style at one of the many rooftop parties in Gaslamp Quater (San Diego’s vibey downtown). Your answer? Something that’s truly adventurous and daring. Here’s some once in a lifetime bucket list experiences in San Diego. Spectacular – There’s nothing more quintessential to Californian-living than a bonfire on the beach. Head to the bay and enjoy making and lighting a giant crackling fire. Sea and Sailing – Head out to the coast and surf some of the best waves in the world. Summit– Feeling adventurous? Make the short hike to San Diego’s Nudist Black’s Beach. If you are classified as a ‘British Citizen’ in your passport, you can get a 90-day visa for San Diego using the Electronic System for Travel Authorisation (ESTA). If you don’t qualify, you’ll have to apply at your nearest US embassy. Remember to apply at least 72 hours in advance. November to March is rainy, with locals coining the phrases “May Gray” and “June Gloom”. Although its warm all year round, visit from April to October for guaranteed sunny days and temperate oceans. To get the best cheap Business Class flights to San Diego, simply complete the form on this page or call 0044 207 255 1234 to speak with one of SkyClub’s fast and friendly experts. We will find you special, discounted fares that are not available online. So, by the time you take your business class flights to San Diego, you’ll feel happy knowing that you’ve paid less than the people seated nearest to you! Have a great trip and – if you want to save money – please book with SkyClub.